After miserably failing in an effort to build effective steam cutters in the 1840s, Harriet Lane was the first steam cutter built for the Revenue Service for a decade. Designed by Samuel Pook, Harriet Lane was a finely finished vessel and found to be extremely useful for many missions. The US Navy used the cutter for the Paraguayan Punitive Expedition in 1858. Stationed in New York, the cutter served to carry dignitaries. When the Civil War began the Navy found itself woefully short of warships and the cutter was placed under naval orders to relieve the garrison of Fort Sumter in April 1861. During this stand off Harriet Lane fired the first naval shot of the war when the steamer Nashville tried to run into Charleston Harbor without displaying the national flag. A shot across the Nashville's bow hastened the Nashville's crew to hoist the flag. 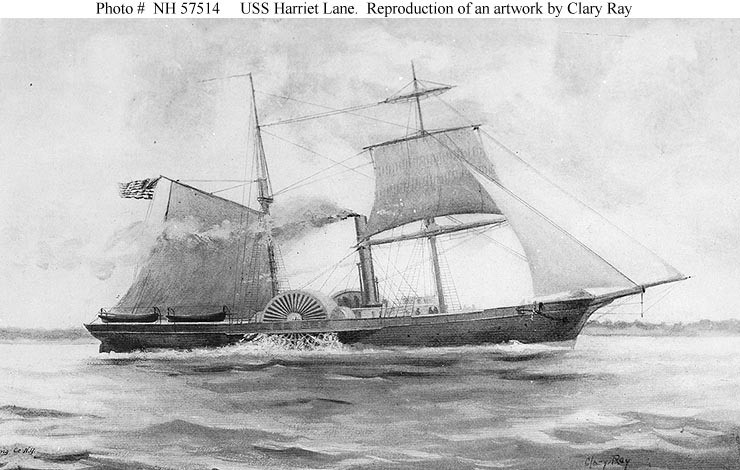 In August 1861, still under naval orders, the Harriet Lane participated in the battle at Hatteras Inlet where she fought forts Hatteras and Clark and provided fire support for infantry ashore. On 10 September 1861, she transferred to the navy. She fought in the Mississippi River, serving with the Mortar Flotilla sent to bombard forts Jackson and St. Philip. She later sailed to blockade Mobile Bay and then Galveston, Texas. On 1 October 1863 the Confederates attacked the vessel, boarded and captured Harriet Lane. After a short tour as part of the Confederate Army's Marine Department of Texas, the department sold her and the new owner converted her into a blockade runner. Renamed the Lavinia, she escaped Galveston on 30 April 1864 and steamed to Havana, Cuba. She remained here for the remainder of the war. In 1867, she was converted to a bark rig and renamed the Elliott Richie. She was lost off Pernambuco, Brazil in May 1884. Sources: United States Coast Guard and U.S. Naval Historical Center.